We’d love your help. Let us know what’s wrong with this preview of A G-Man's Journal by Oliver Buck Revell. 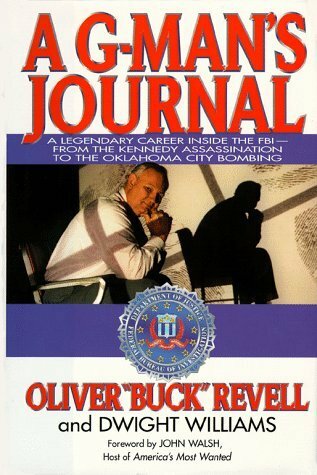 From 1964 to 1994, Buck Revell directed or participated in virtually every major FBI investigation-- including the JFK assassination, Watergate, the Iran hostage crisis, and Gulf War antiterrorist operations. As the former Associate Deputy Director in charge of investigations, the Bureau's number-two career post, he sealed his reputation as a legendary maverick in federal From 1964 to 1994, Buck Revell directed or participated in virtually every major FBI investigation-- including the JFK assassination, Watergate, the Iran hostage crisis, and Gulf War antiterrorist operations. As the former Associate Deputy Director in charge of investigations, the Bureau's number-two career post, he sealed his reputation as a legendary maverick in federal law enforcement. Now, in a landmark autobiography, Revell candidly reveals the brilliance and deep-rooted flaws behind thirty years of FBI investigations. Known early on for his street-smart, proactive, and hard-hitting style inside J. Edgar Hoover's Bureau, Revell hunted down Mafia hit men, Ku Klux Klan-type terrorist groups, and Eastern Bloc spies. Quickly rising in a system that was often its own worst enemy, he discloses why, after Hoover's death in 1972, he and other reform-minded agents moved to modernize the FBI both tactically and technologically-- and how he developed investigative strategies, innovated specific surveillance methods, and championed special FBI units, such as Special Events Management and Hostage Rescue. As skilled at advising heads of state as collaring criminals, Revell was often summoned to the White House Situation Room. As the senior FBI representative to the National Security Council, he emerged as one of our leading authorities on terrorism and national security issues. He recounts how he persuaded Congress to enact Federal laws regarding fugitive apprehension abroad, and how he directed all international operations-- including tracking the kidnappers and killers of hostages in Beirut, international mafias weapons smuggling, and French and Japanese industrial espionage. He also demonstrates why it is vital for the FBI to become a global nerve center for the world's law enforcement agencies. On the home front, Buck Revell continues to advise the National Security Council, the Pentagon, and the Justice Departments on matters of organized crime, drug enforcement, white-collar crime and terrorism. In "A G-Man's Journal", he proposes drastic reforms for improving the current system of law enforcement and justice, and bluntly analyzes what went wrong at incidents like the Branch Davidian tragedy in Waco, and the World Trade Center and Oklahoma City bombings. To ask other readers questions about A G-Man's Journal, please sign up. Very informative even if the author was both knowledgeable and in the high ranks of FBI Management. It is a bit "blow your own" but if you want a glimpse of some of more powerful leaders in the FBI, read this book.